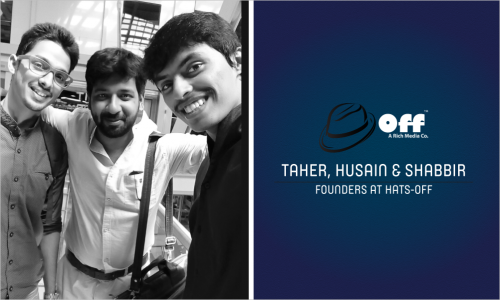 Hats-Off (A Rich Media Co.) founded by the trio, Shabbir Hussain, Taher Mandiwala, and Husain Habib. Shabbir Hussain did BCOM, Taher Mandiwala did Bachelor of Computer Application from University of Pune and Husain Habib is an IIT Passout in Management. Together, the trio co-founded Hats-Off (Rich Media) communication agency, which is dedicated to creating, building and energizing brands. With a blend of purpose-driven creativity,brand marketing acumen,Mobile,Research and Digital media prowess, it delivers programming that creates powerful connections between people and products. 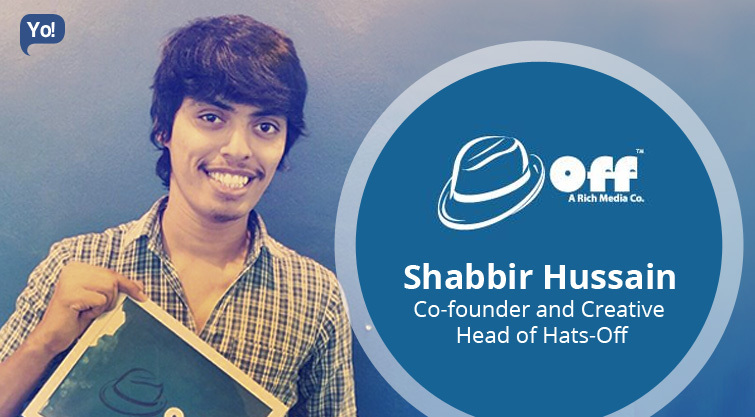 Hats-Off, founded in autumn of 12th Oct’2011, is a full-service digital marketing agency which is trying to solve dormant problems in the world of digital marketing. Through our service, we wish to provide quality Social Media Marketing, Search Engine Optimization, Wikipedia Page Creation & Maintenance, Web & Mobile App Development/ Design solutions, regardless of the scale and nature of requirements. We have in-house capabilities for Development (Mobile & Web), Social Media Strategy and Creative & Design. We have worked with brands like Big FM 92.7, Park Avenue, Exchange4Media, Impact magazine, Raymond, Adventure Island, RBL, Velvetcase to name a few, on different aspects of Digital Marketing. Frankly it was a need of the hour, a need to have something that is self brought up, self funded & purely managed by we three – Shabbir Hussain, Taher Mandiwala & Husain Habib. It was just a random thought of starting up a digital advertising agency 4years back from now when digital was just at it’s early stages of blooming in India with major digital agency already having their base in Mumbai & Delhi. Mantras work for Baba’s, for us “Hard-work” is the only Mantra that will never let you fail in any stream of life. The biggest challenge was our qualification & finance back in 12 October’2011. None of us belonged to this space, I myself worked as a sales & service executive in Nokia India & belonged to a telecom industry, Taher Mandiwala worked as a networking solution guy in Cisco & Husain was trying his hands on short film directions & photography. Back in 2011 we wonder what SEO, SMM & Terms like SEM meant. We started up Hats-Off at mere capital of 20,000/- in a borrowed small shop space of 150sqft. having lost around 10k in paying off some wrong shop electricity bill, having 10,000/- in hand to sustain with. Since then we have never had any task being done smoothly at once, we now know that anything that needs to be done will take 2 steps for sure to complete off perfectly for us. This wasn’t enough, we decided to split up our work in three areas – Shabbir Hussain – Creative Head (Manage design, content, ideas, campaigns), Taher Mandiwala – Technical Head (Websites, SEO, Adwords, App Development), Husain Habib – Business Head (Networking & getting business). I never knew what Adobe was for & what tools like Photoshop, Illustrator could do in digital & designing world, but having a creative approach in life I self nurtured the skills in designing, took me 4years of practical learning to now call myself a Creative Head. Taher too had a hard time to understand what it was like to work on SEM & App development, Husain build it up with his management skills of-course. The emotional & mental support of we three for each other has helped us overcome all the initial challenges. We have never opted for Investments & aren’t looking for any in near future as well, It is that 20,000/- INR which we invested in our company that has turned some 100 folds for us now. Brain Drain? What’s that? You can drop down to our office anytime & you will see our team all charged up, they are never out of power, Music, Dance & Masti is the key rule of Hats-Off to work more creative & productive. Someone to criticize your dreams. For Designing, Ideas & Concepts our inspiration is – Freepik, Pinterest, Flickr. For Everything Else – Google & YouTube are at our rescue. Watching Movies, TV Series & Some Mind Blowing Sound Tracks. Performing beyond expectations can sometimes be a minus point too. Flaunt your skills, what’s in your head can be a powerful idea nobody ever thought of, bring it out. Do not hide your plans, nor reveal them all at once. Go slow, success & money will follow, rushing can exhaust you sooner. Learn from the turtle. This time with the experience & capital in hand we would surely do wonders for our clients & wouldn’t let the errors & mistakes of past get into our way. With working environment like this, Hats-Off is always our weekend getaway for some serious gaming sessions, but to name two more than you can surely count – Mumbai being the second & Goa in still in our wishlist.